Director Kim Ji-hoon (김지훈) has a lot riding on disaster film The Tower (타워). His last film, sci-fi monster movie Sector 7, was reviled by critics and audiences alike and became one of the worst flops in Korean cinematic history (although it went on to secure the highest gross for a Korean film in neighbouring China). As such, questions involving his next project The Tower (타워) lingered. Had director Kim Ji-hoon managed to develop his visual aesthetics, and more complex characters and plots, into a more convincing, compelling film? The answer is, perhaps unsurprisingly, yes and no. The Tower undoubtedly boasts some of the most impressive visual effects work ever produce within a Korean film, to the extent that it’s comparable with Hollywood productions. The sets and the stunt work are genuinely enthralling, combining to produce edge-of-the-seat sequences that are incredibly engaging and convey a palpable sense of realism and danger. That said, the movie only contains an emotional core due to the performance of Seol Kyeong-gu (설경구) as firefighter captain Kang Yeong-gi as the vast majority of protagonists are one-dimensional stereotypes, while the actors that portray them overact to an almost ludicrous degree. It’s Christmas Eve in Seoul, and that means only one thing for the luxurious Sky Tower buildings – an exclusive Christmas party amongst the social elite of the country. Overseeing the operations are operations manager Lee Dae-ho (Kim Sang-kyeong (김상경), and the object of his affections catering manager Seo Yoon-hee (Son Ye-jin (손예진), who become closer as the deadline approaches. As the party grows nearer safety concerns begin to amount, yet are disregarded with plans forced through by the rich and powerful. When helicopters begin to circle the buildings creating a snow effect, the high winds force one of the choppers into a tower causing a fiery explosion and cutting off all exits for the patrons. Springing into action, firefighter Captain Kang Yeong-gi (Seol Kyeong-gu (설경구) leads his men, including joker Byeong-man (Kim In-kwon (김인권) and rookie Lee Seon-woo (Do Ji-han (도지한), into the building to hunt for survivors. Taking huge reference from 1974’s The Towering Inferno as well as the 9/11 twin tower attacks, director Kim Ji-hoon’s The Tower is an exciting and exhilarating experience. Post-production on the disaster film has taken around two years to complete and it shows; the explosions, destruction, and stunts are convincing throughout as fires rage and people die in tragic and horrifying fashion. The film undoubtedly sets a new standard of quality in Korean cinema for special effects prowess, as helicopters collide, concrete fractures underfoot, and fire engulfs everything in its path. Interestingly, the cause of the disaster is akin to Titanic in that the sheer arrogance of those who dwell in Tower Sky, continually referring to their location as ‘heaven’ and close to God, are conveyed as the symbolic perpetrators of the destruction, adding something of a morality play to the devastation. Yet the visual aesthetics are nothing without an emotional core, and in this respect The Tower somewhat succeeds. The introduction of the various protagonists working and dwelling within Tower Sky is a highly mixed affair, generally featuring stereotypes. Interesting members such as operations manager Lee Dae-ho and daughter Ha-na, and catering manager Lee Yoon-hee, are compelling but receive little character development due to unimportant tertiary characters entering the narrative that have no real impact. Also, the extreme overacting by most of the cast is an enormous irritation, notably Kim Seong-oh as chef In-geon who is intended as comic relief but is infuriating throughout. 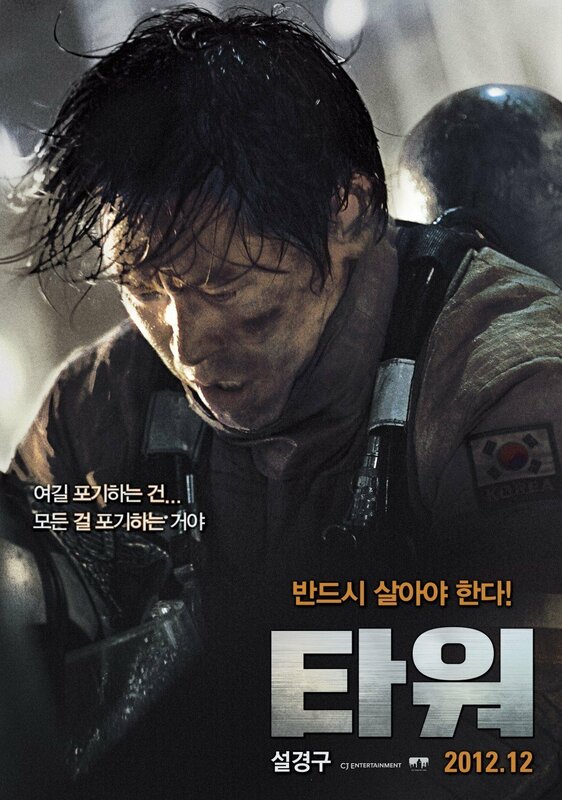 The saving grace of The Tower comes in the form of firefighter Captain Kang Yeong-ri, who provides much needed heart and soul to the rescue attempt as he gallantly battles blazes, disintegrating floors, and corrupt officials in his single-minded quest to get the survivors to safety. Wonderfully performed by actor Seol Kyeong-gu, the captain’s mission is the driving force of the film and is genuinely enthralling to watch, with his sense of duty and responsibility simultaneously sincere and poignant. Captain Kang Yeong-ri is also joined by the humorous Byeong-man and newbie Lee Seon-woo in the search for survivors. Byeong-man provides comic relief, generally in the form of silly frivolity, which is mildly amusing in breaking up serious scenes. Lee Seon-woo however is one of the more intriguing characters, as he undergoes a transformation from reluctant rookie to employing skills learnt from Captain Kang, and his development is highly enjoyable. 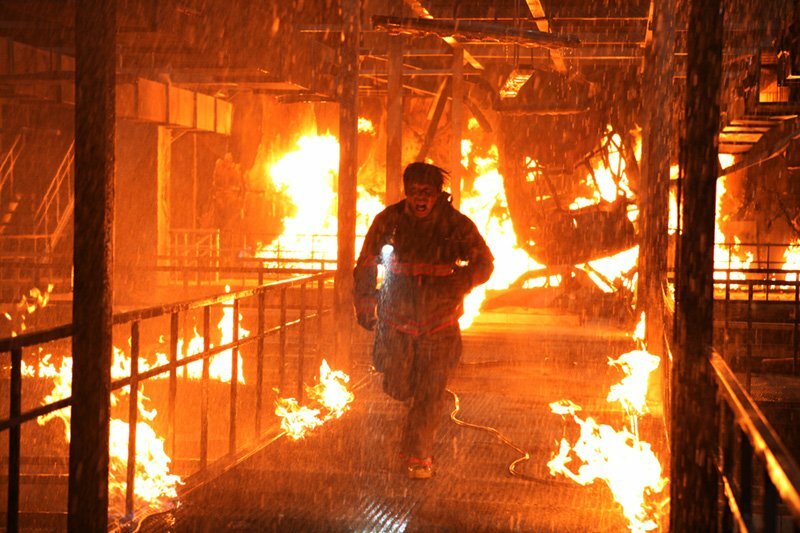 The three fire fighters routinely feature in very impressive stunt work throughout the film, and their successes and failures do not fail to induce an adrenaline rush. Operations manager Lee Dae-ho also partakes in stunts, as the ‘everyman’ forced to find courage to protect his makeshift family. Such scenes are also entertaining, although they often push the suspense of disbelief to its limits, yet are engaging nonetheless. Unfortunately due to the vast number of supporting roles, Lee Dae-ho’s burgeoning relationship with Seo Yoon-hee is largely overlooked, begging the question why such talented big name stars as Kim Sang-kyeong and Son Ye-jin receive so little screen time. However, despite being underdeveloped their relationship does provide impetus to certain scenes as well as some tender moments. The Tower is an extremely visually impressive disaster film, and a return to form for director Kim Ji-hoon. The special effects and stunt work are some of the best ever produced within a Korean film, and certainly on par with Hollywood films of a similar ilk, conveying a genuine sense of danger throughout. That said, the vast number of stereotypical supporting roles bog the story down resulting in an overall lack of character development and audience investment. Lucky then that Seol Kyeong-gu enters the fray as Captain Kang Yeong-ri, who single-handedly lifts the film into a compelling and emotional story, making The Tower an enjoyable entry into the genre.